It’s Summer – So Why Not a Garden Fresh Greek Lasagna? This lasagna is low carb, high protein and totally gluten-free. This week, I ended up with a ton of fresh garden vegetables. My sister-in-law gave me a few fresh zucchini and tomatoes from her garden, and then my neighbor brought over a ton of heirloom tomatoes. So, of course, my brain started thinking about what I might create with this windfall of beautiful ingredients! With all that fresh zucchini, the first thing that came to mind was gluten-free lasagna. 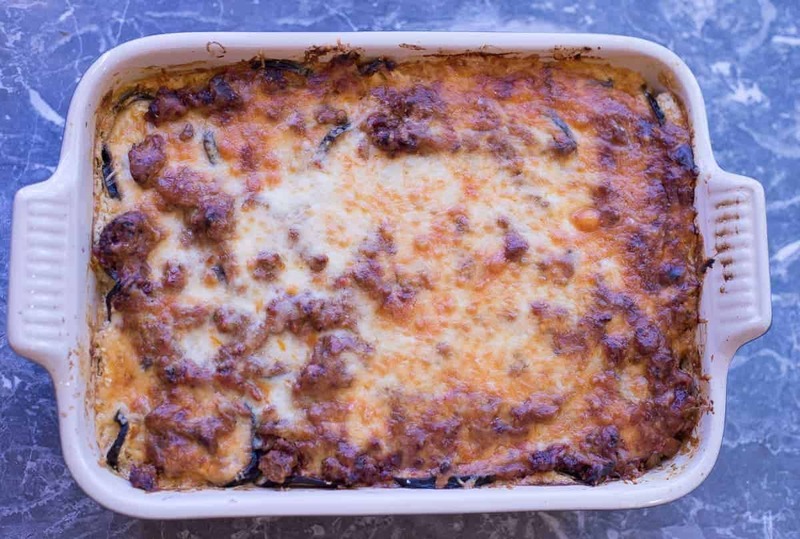 But then really…how many times has typical no pasta lasagna been done? I wanted to find my own way of redoing this dish. Reaching for ideas I dove into my freezer. I found a nice lamb steak that I bought for something last month and ended up not using. 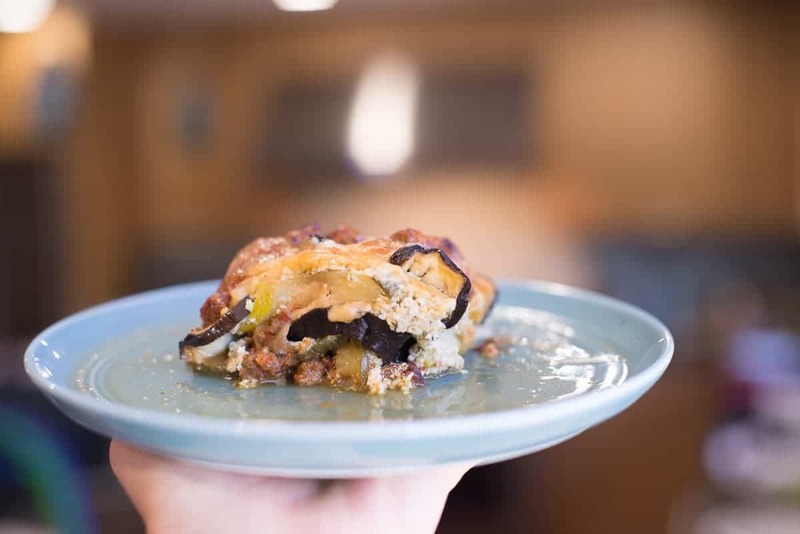 And the idea was born – Garden-Fresh Greek Lasagna. I love all the flavors in Greek food. Building this Greek Style Lasagna was super exciting. A rich roasted red pepper bolognese sauce came to mind. I could picture layers of zucchini and eggplant nestled between lemon dill ricotta and melty mozzarella cheese. Roasting the veggies is essential for getting a rich flavor into the roasted red pepper bolognese sauce. I roasted these veggies and my garlic in the oven for about 40 minutes. Make sure you watch it because oven temperatures vary. The lemon dill ricotta is so light and fresh and gives this lasagna its distinct Greek flavor. When I smelled it cooking in the oven, I knew it was going to be amazing. We hope you enjoy this fresh, delicious lasagna. Remember, Sharing is Caring so please give a share on your favorite social media. We appreciate all of the love  and support. 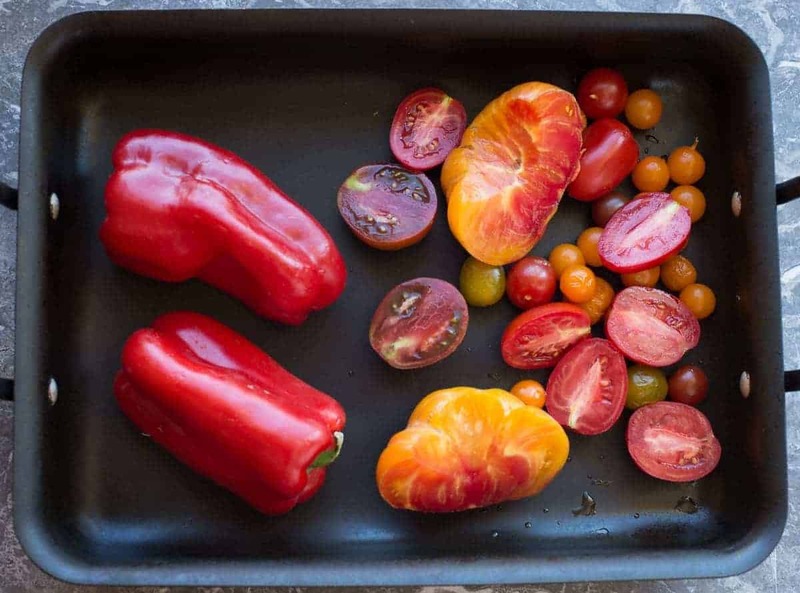 Place the bell peppers, tomatoes, 8 peeled cloves of garlic, olive oil and salt and pepper into a roasting pan. Roast for about 40 minutes. Remove from oven and place red peppers into a ziplock bag to cool. Set the remained of the roasted veggies to the side. Turn oven off to cool. Using a mandoline, slice zucchini into long slices about ¼ inch thick. Slice eggplant into ¼ inch thick rounds. Lay the zucchini, one layer thick, on a clean lint free dish towel and salt generously. Cover with another towel and repeat with the remainder of the zucchini and eggplant. Cover all layers with a final towel and let them sweat until ready to assemble. Add ricotta, greek yogurt, pressed garlic, lemon zest, lemon juice and dill to a medium bowl. Mix well. Add eggs and whisk until well blended. Add 1 tsp salt, and 1 tsp pepper. Brown lamb, ground beef and onions in a sauce pan. Add roasted tomatoes and garlic to a large sauce pan. Remove skin and seeds from the roasted red peppers. Add roasted red peppers to the sauce pan. Using a stick (immersion) blender, puree the roasted tomatoes, garlic, and red peppers until smooth. Add browned meat mixture to the pureed roasted vegetables. Add oregano and crushed red pepper. Simmer for 20 minutes. Add ⅓ bolognese to the bottom of a lasagna pan. Add one layer of zucchini. Add a layer of lemon dill ricotta. Add a layer of eggplant. Add another ⅓ of the bolognese. Add ½ of the shredded cheese. 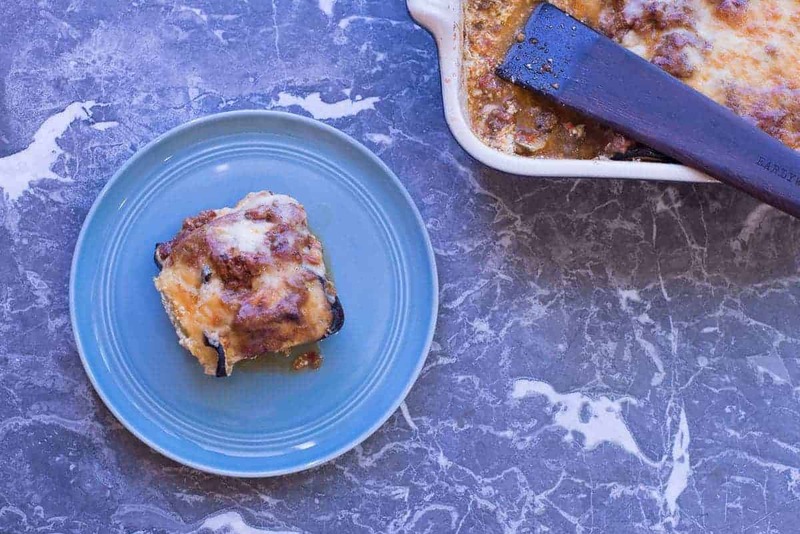 Place lasagna pan on a cookie sheet. Bake for 1 hour. Until cheese is bubbly and brown.